We know good suppliers are hard to find. Partnering with us gives you a reliable addition to your team. We are here for the long haul and will do what it takes to support your success. Our volumes, reliable workforce and experience mean we have streamlined our production processes and reduced labor and overhead unit costs. Savings we pass to our customers. We make sure your pieces will look great at retail. If we think they won’t, you will hear from us. Murtex never has and never will sell our own products to retailers or consumers. Murtex will not discuss our customers with other customers or prospective customers. Our business is about your trust in our ability to focus on detail and disciplined execution, and these four Guiding Principles help guide our actions. Together, they create an environment of execution, partnering, teamwork and collaboration with our customers and within our company. Integrity is the heart of a partnership. We will do what we say, and say what we do. We will admit to our mistakes, learn, and take corrective action. Our customers demand reliable execution every day. Reliable execution demands disciplined people, thought, and actions. Creating value and serving customers brings meaning. We will deliver value for the customer. 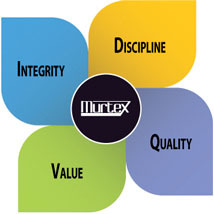 Social Responsibility is taken seriously at Murtex, covering ethics, people, and the planet.